Peter Funk: pioneer tailor; born on 25 November 1833 to Peter and Helena (Schroeder) Funk in Kronsthal, Chortitza Colony, Russia, as the fourth of nine children, baptized on 31 May 1854 in the Bergthal Colony of South Russia, and married on 12 September 1854 to Maria Krahn (b. 6 March 1835 d. 1 March 1907), daughter of Nicholas and Anna (Penner) Krahn. The couple had ten children, one of whom died in childhood. 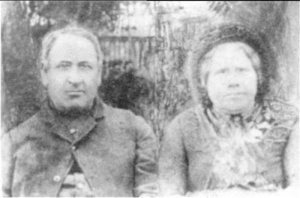 Peter and Maria Funk immigrated to Canada arriving in Quebec on 27 July 1874, before continuing on to Manitoba, where they evenually settled in Gnadenfeld in 1876. They lived in the village and farmed until 1892 when the moved onto their own homestead. Peter S. Funk had training as a tailor and sewed clothing for the whole family. After Peter died in 1903, his widow Maria went to live with her youngest daughter on a nearby farm where she died in 1907. Braun, Ernest. “Gnadenfeld—The Funk Clan.” Preservings No. 15 (December 2007): 90-102. GRANDMA (The Genealogical Registry and Database of Mennonite Ancestry) Database, 5.03 ed. Fresno, CA: California Mennonite Historical Society, 2007: #185178. Huebert, Susan. "Funk, Peter (1833-1903)." Global Anabaptist Mennonite Encyclopedia Online. December 2007. Web. 18 Apr 2019. http://gameo.org/index.php?title=Funk,_Peter_(1833-1903)&oldid=94779. Huebert, Susan. (December 2007). Funk, Peter (1833-1903). Global Anabaptist Mennonite Encyclopedia Online. Retrieved 18 April 2019, from http://gameo.org/index.php?title=Funk,_Peter_(1833-1903)&oldid=94779.